After the events of the 3rd Secret War Peter Parker achieves unprecedented success in his professional career. Parker Industries (a company spawned by SpOck) is a world-wide business leader in the technology sector, whilst also helping to support S.H.I.E.L.D. Aside from strategic and economic success, Parker Industries also helped fund the Uncle Ben Foundation which provides global humanitarian aid. So for all intents and purposes Peter Parker is now a global icon. Despite the global ambitions, Peter creates a presence for his company in New York City. In fact, he chose a location very close to his heart…the Baxter Building (former HQ of the Fantastic Four) to be the site of Parker Industries New York. As a quick aside, Peter mentions that Alchemax, Roxxon and H.A.M.M.E.R. put bids in on this property (how was H.A.M.M.E.R. able to do something like that aren’t they caput?). Even more intriguing (and arguably even more close to his heart) he appointed his best friend Harry Osborn to help run the business out of his New York offices. Three interesting facts about Harry at this point, he’s changed his name to Harry Lyman (taking his mom’s maiden name), he seems to be no longer in the witness protection program and he is (seemingly) still unaware that Peter is Spider-Man. However he is aware of his own past as the Green Goblin. 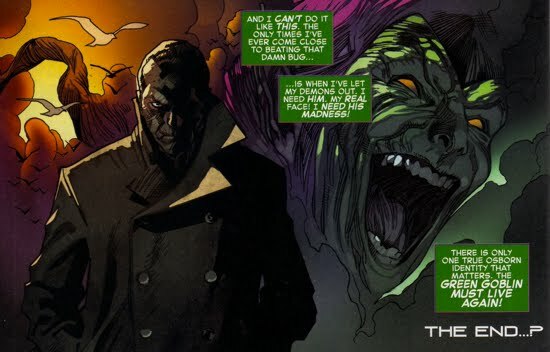 So this all brings us to the now clandestine original Green Goblin…Norman Osborn. Norman had apparently lost his enhanced strength and stamina after the events of Superior Spider-Man #31. But what he lost in power he gained in stealth, Norman was using face-altering strategies to conceal his identity whilst wreaking havoc. 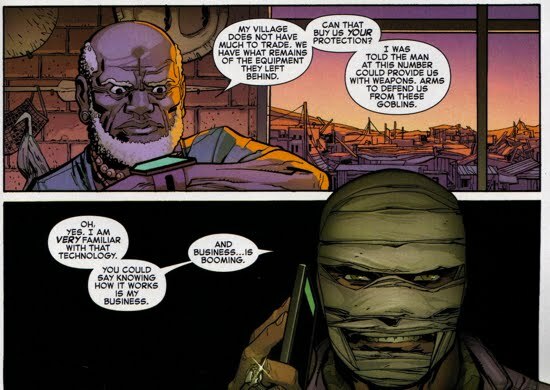 A heavily face-bandaged Norman Osborn emerges from the shadows for the first time in Amazing Spider-Man V4 #3 in the African nation of Nadua. Osborn was summoned to Nadua by General Mwenye, the leader of that country. Mwenye, an obviously corrupt general, wanted the Uncle Ben Foundation out of his country, he did not want his people supplied with free solar power. Unfortunately for Mwenye, he did not want to fight Parker Industries head-on because his men are no match for someone who makes weapons for S.H.I.E.L.D. He wanted Osborn’s technology to take on this fight…Norman complies. In Amazing Spider-Man V4 #4, the Uncle Ben Foundation, chaired by Aunt May and her boyfriend Jay Jameson, prepares to unveil the completion of their first humanitarian project in Nadua. Suddenly pumpkin bombs rain down from the skies as the civilians scatter for shelter. 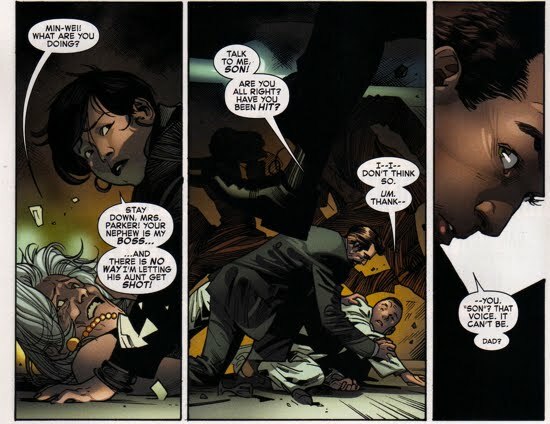 Alarmed by his aunt’s dire situation, Peter bails on his S.H.I.E.L.D. responsibilities and rushes to Nadua to rescue May, Jay and the Naduans. When Peter arrives in Nadua he finds a half-dozen or so War Goblins (new term!) equipped with goblin gliders and pumpkin bombs wreaking havoc upon the landscape. It appears as though their targets, for the most part, are not the civilians but rather the solar panel grids. Using a combination of his Spider-Jet (or is it Spider-Plane? ), help from his Avenger ally Mockingbird and an EMP (electromagnetic pulse), Peter is able to eventually diarm the the War Goblins and take them into custody. 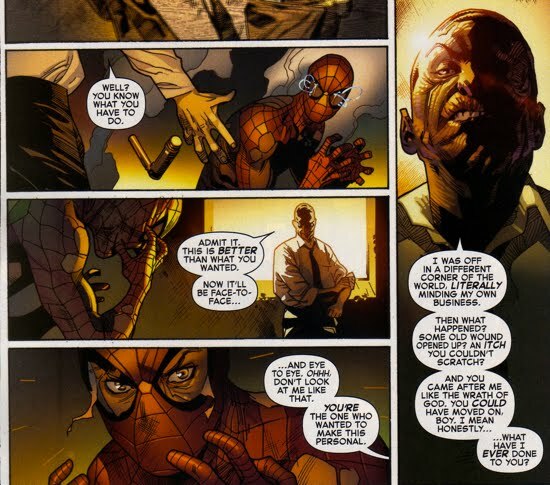 As Spider-Man, Peter vows to the village leader, Mr. Okiro, that Parker Industries will rebuild all the property that had been damaged by the Goblins’ attack. Shockingly, Okiro refuses his help or the help from an more humanitarian acts as he claims that all it does is make them targets of General Mwenye. Since Parker will not be there to constantly guard the panels, then he doesn’t want them at all. 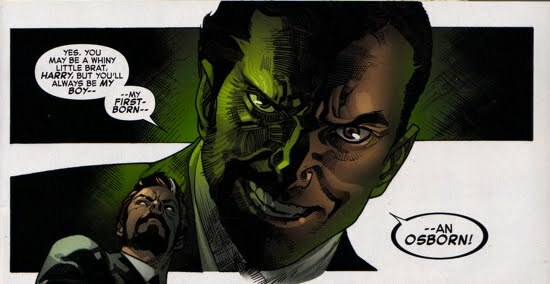 The return of Norman Osborn began in Amazing Spider-Man (Vol. 4) #25 and that story opens in a shady alley of Las Colinas Rojas, the drug capital of Delvadia. There's a sting operation underway and Spider-Man is leading the charge. However, unbeknownst to our webslinger there is another vigilante on site, but she's using some type of cloaking device so she's essentially invisible. After a few Spider-pods clear the riff-raff at streetlevel, Spider-Man, Mockingbird and two Delvadia-native super heroes (Tarantula and the Devil Spider) come crashing on to the scene ready to infiltrate Osborn's supposed hideout. As they make their way in to the compound they're greeted by some machine gun-toting Goblin soldiers...more proof that Spider-Man and his team are on the right path. 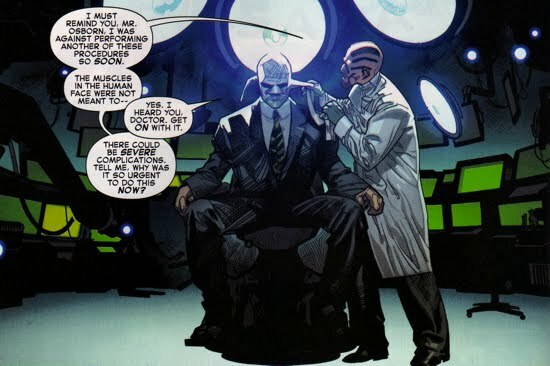 Remember that Spider-Man was given Osborn's location from the intel that the Kingpin had provided in Dead No More: Clone Conspiracy Omega #1. Meanwhile, back at surface level our invisible female vigilante is preparing to blow up the underground hideout, but first she has to clear innocent bystanders. Back inside the bunker Spidey's frantic search to catch his old foe is summarized by the three words he screams out, "I want Osborn!" Spidey's intel has him searching for El Facoquero, Delvadia's foremost drug dealer/gun-runner. But Spidey believes Osborn and El Facoquero are one and the same. Suddenly, there's a tremendous explosion, perpetrated by the invisible vigilante who appears to recognize Spidey and who also seems to not care that she just left him for dead beneath the streets of Las Colinas Rojas. Despite the ceiling crashing down, Spider-Man and Mockingbird continue after El Facoquero who was attempting to flee. Spidey catches the drug runner then cleverly explodes a pack of pumpkin bombs beneath a pool allowing he, Mockingbird and the captured El Facoquero to evade the collapse through the sewage system. That was the good news, the bad news was that once they arrived back at S.H.I.E.L.D. HQ, the blood tests confirm that this is not Norman Osborn...Spider-Man smashes a table to pieces in anger at the results! The story shifts back over to Peter Parker aboard his private jet, plotting his next attempt to find Norman. Peter and Bobbi Morse (aka Mockingbird) decide to head to Hong Kong next because there had been El Facoquero sightings there and Peter's Uncle Ben Foundation would be hosting an event in the same city. Before heading to Hong Kong, Peter returns Uncle Ben to his original burial plot whilst contemplating the events of The Clone Conspiracy. As a quick aside, Peter insinuates that Gwen Stacy was his "greatest love"...what about Mary Jane?! Peter visits with Aunt May, Harry Osborn and Betty Brant (who were all together) just before leaving for Hong Kong. Betty mentions an odd phone call that she received from Ned Leeds, most likely made by the resurrected Ned during The Clone Conspiracy. The phone call led Betty to seek out a spiritual advisor. Soon after, Peter's aboard a plane with Bobbi en route to Hong Kong. Peter wakes Bobbi from her nap and asks her if she's ever considered dating him. Before Bobbi could answer, Aunt May pops in to their conversation and announces that she's coming to Hong Kong as well (Peter wanted all his friends to stay behind since he knew it would get dangerous whilst tracking Norman). It was not obvious to me how Peter would have noticed Aunt Many being onboard prior to that, but I digress. And Aunt May was not the only stowaway onboard, Harry Osborn was making the trip as well. 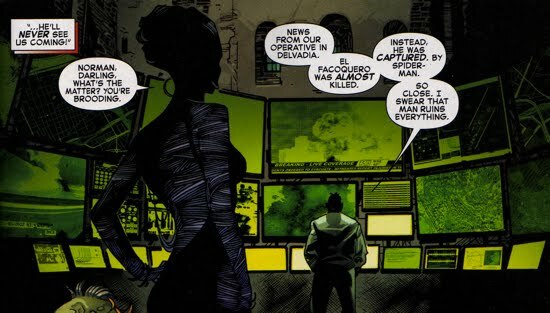 Once they touch down in Hong Kong, Peter and Bobbi immediately switch to their alter egos and start knocking heads in order to shake down information on Norman's whereabouts. 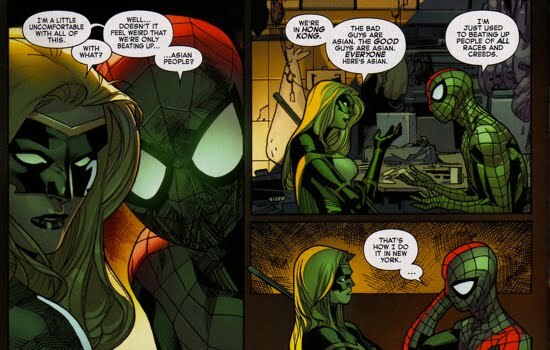 What followed was an odd scene where Spidey and Mockingbird feel "weird" beating up "asian people" so they decide to go to a place where the people wear masks and thus you wouldn't know that they're asian. Spidey and Mockingbird make a mad dash to the U.B.F. event, but its too late Osborn is already there...in disguise of course! Osborn is perusing the crowd and he spots Aunt May, he decides he can't pass up the opportunity to talk to Aunt May with a face "she'd never recognize." 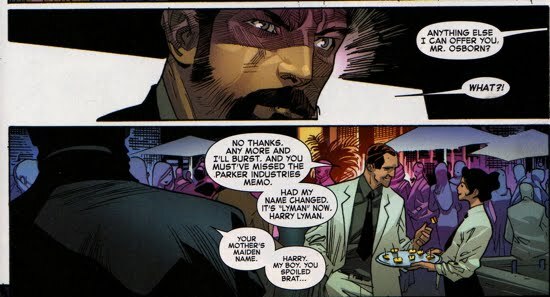 Before Norman can make his way to her, some impeccable timing and awkward dialogue contribute to Norman overhearing Harry telling a waitress that his name is Harry Lyman and not Harry Osborn. This, as you would expect, enrages Osborn to hear his son refuting the Osborn Legacy. Just then, the invisible vigilante is poised with a rifle ready to snipe out someone from the U.B.F.! Spidey swoops in, takes out the shooter and uses his electrified web coils to short circuit her invisible suit. To Spidey's surprise the sniper is revealed to be none other than Silver Sable! After Spidey exclaims "you're supposed to be dead, what's going on?! 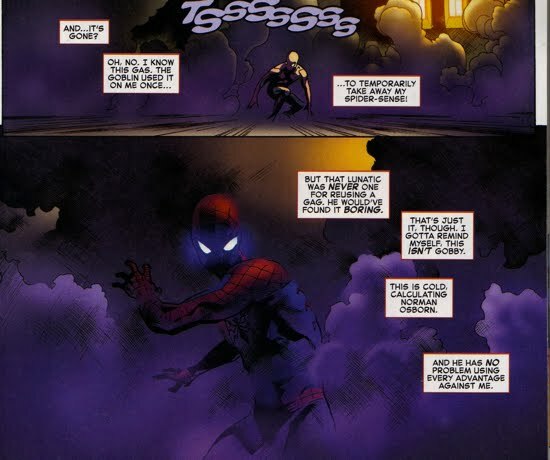 ", the former mercenary's response is simply, "What's going on....is that you just saved Norman Osborn!" Amazing Spider-Man (Vol. 4) #26 continues with Silver Sable's misfired shot alarming the crowd attending the Uncle Ben Foundation Gala sending all the party-goers into a panic. 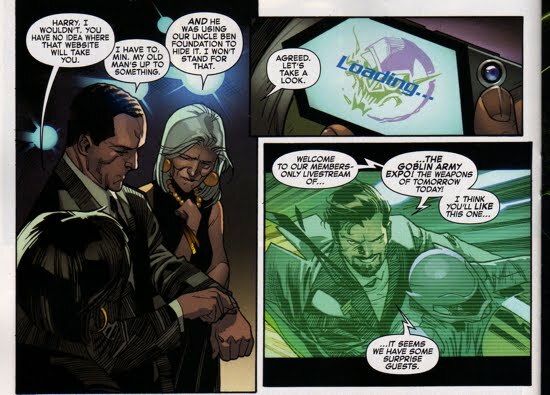 Norman Osborn, in a disguise eerily similar to Tony Stark, attempts to cover his son and protect him from the attack. 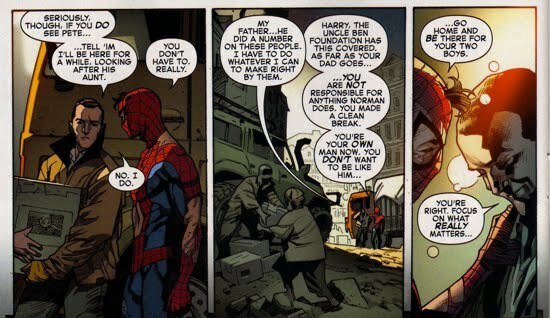 What appeared to be an altruistic act was nothing more than Norman using the opportunity to let his son know he's there and that he (Harry) will always be an Osborn. Norman is then scooped up from the rooftop by a crew of militants flying green and purple motorcycles (which Osborn refers to as Glide-cycles); he then announces to his soldiers that "we're starting the show ahead of schedule." Spidey, Silver Sable and Mockingbird head out in pursuit of Osborn. 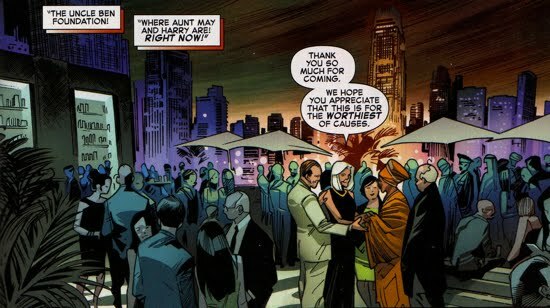 Back on the rooftop Harry Osborn, now aware of his father's presence at the gala, tracks down one of the attendees that his father had been conversing with, convinced that he was working in collusion with Norman. It turns out that Osborn had planned to use the gala as a cover for inviting a select few to preview his latest in weapons technology. The man handed Harry a business card with the Goblin insignia that contained a url, presumably a link to a live demo. Whilst in pursuit of Osborn, Mockingbird is forced to disengage from the effort after her boss, Nick Fury, orders her to return home. Fury cites that she is 'out of her jurisdiction' and working with an international terrorist (Silver Sable). S.H.I.E.L.D. cannot be associated with this type of espionage...especially since the Chinese authorities were unaware that S.H.I.E.L.D. agents had been operating in Hong Kong. Which leaves only Spidey and Silver Sable to follow Osborn. The duo eventually track Osborn to what appears to be a residential high-rise building, they both suggest that this is a trap...and they're both right! Osborn is waiting with a crowd of potential buyers as he boasts that the viewers this evening will witness his weapons eliminate Silver Sable and Spider-Man. Harry, Aunt May and Min-Wei watch the demo from the link that was listed on the business card. Sable and Spidey's initial presumption was that they would be battling the Glide-cycles, which they dismantle with ease. 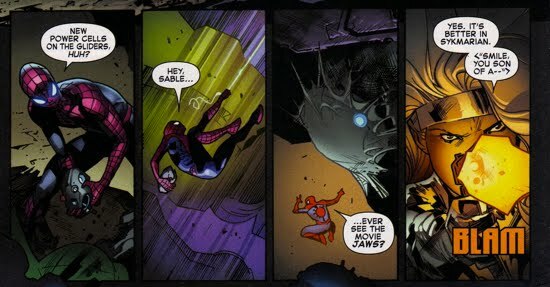 Osborn's pitch to the crowd is that the Kingslayer will defeat two superhumans (Sable and Spidey), one of whom is equipped with Parker Industries technology. The involvement of PI technology goes viral and the local branch leaders (Phillip Chang, Max Modell, Anna Maria Marconi, etc) report to Harry that the company's apparent involvement in weapons testing is not a good thing (no duh!). Even the newly minted Superior Octopus (aka Otto Octavius) is following the developments as he remarks to himself that Parker is destroying the company that he built! 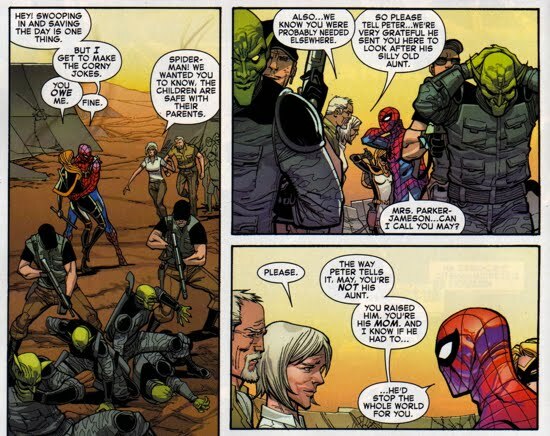 Spider-Man and Silver Sable are able to hold their own against the Kingslayer, Peter even manages to get under Osborn's skin suggesting that the Goblin isn't man enough to go face-to-face with the webslinger...prompting Osborn to cut the feed. A quick-thinking Spidey grabs one of the power cells from the Glider-cycles and uses it to blow up the Kingslayer, ending the live demo. Three developments wrap up the second installment of this arc. One, Peter and Harry discuss the use of Parker Industries equipment to invade Symkaria and take down a terrorist...which is a risky venture to say the least. But Peter is 100% committed to doing so in order to stop Norman. Second, Otto Octavius apparently has hacked Harry's Webware device so the Superior Octopus has a direct line to listen in on everything said between Harry and other PI company leaders. Otto then feeds that info directly over to S.H.I.E.L.D., which leads to our third and last point. Mockingbird, now back at S.H.I.E.L.D. HQ, listens as Nick Fury announces to his organization that Parker Industries is now a threat at the level of Hydra and A.I.M....and that S.H.I.E.L.D. is severing all ties with the company. Mockingbird is forced to comply. Amazing Spider-Man (Vol. 4) #27 opens with Doctor Dragovic unraveling the medical gaws wrapped around Norman Osborn’s face, he had just undergone another face-altering procedure. The doctor reminds Norman that he was against performing this procedure so soon, and that the face muscles were not meant to be altered so frequently and so drastically. 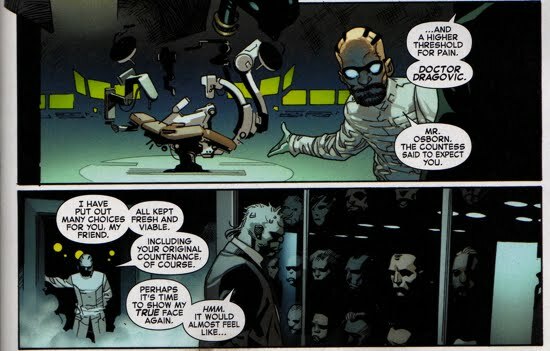 Osborn ignores the doctor’s advice as he recalls Spider-Man’s taunts that Norman would not show his face in public or confront Spidey face to face (which happened last issue). 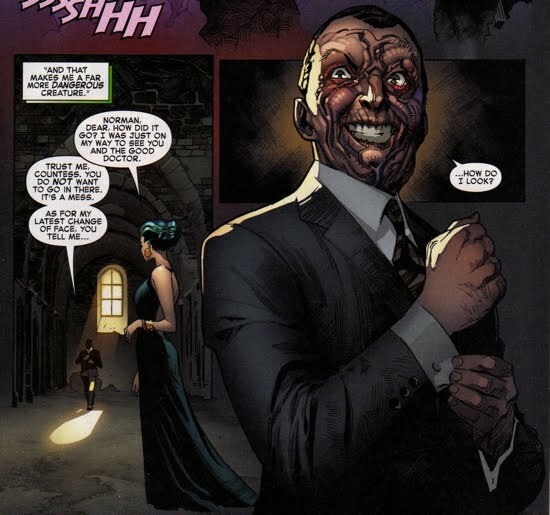 Unfortunately for Norman, Dragovic was right and when Osborn’s face is revealed it looks like a melted, grotesque version of his real (original) face. Osborn then tells Dragovic that he no longer has use for him so he gases the doctor with a new version of the Goblin Formula. Dragovic collapses to the ground as Osborn reminds him that he (Osborn) is immune to the Goblin Serum and that he is no longer insane. Norman then joins Countess Karkov and she is completely unphased by his horrific appearance, in fact she compliments him on how “he looks like a man who has brought new life to [her] country.” The two then walk to the balcony of Castle Karkov and look down upon “their kingdom” as they enjoy the sweet success that Norman’s “ingenious inventions and revolutionary ideas” have brought to the people Symkaria….converting it to the largest weapons manufacturer in the world. The story then shifts over to Spider-Man and Silver Sable, sitting alone in the cargo hold of one of his Parker Industries planes. 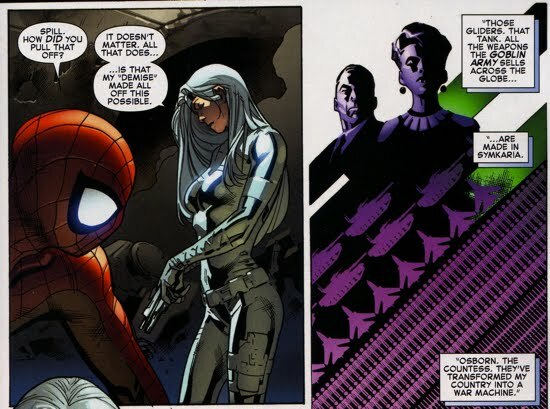 They’re sitting amongst various Spider-Mobiles and since they have time before they land in Symkaria, Spidey asks Sable to explain how she evaded death. She tells him that whilst Rhino held her underwater she activated her stealth suit (similar to the one we saw at the beginning of this arc). Rhino thought she had vanished, which gave her the upper hand and she was able to kill him and escape. With the world believing she was dead, Sable was able to take out her enemies one by one, but her absence also allowed Karkov to run Symkaria in to the ground. She wants to return her people to freedom. Back at a S.H.I.E.L.D. holding facility in Hong Kong, Fury interrogates Aunt May and Harry Osborn since he is convinced they are aware of Peter’s plans to attack Symkaria. He receives no useful information from the pair, nevertheless he readies his forces (led by Mockingbird) to infiltrate the Parker Industries plane once it lands. When the S.H.I.E.L.D. agents board the plane, they find it empty and Morse nowhere to be found. Mockingbird had double-crossed Fury as she worked with Spider-Man and Silver Sable to land a different plane far from the S.H.I.E.L.D. agents. Infuriated, Fury calls Mockingbird and she officially resigns from S.H.I.E.L.D. and joins Spider-Man, Silver Sable and the new Wild Pack as they prepare to storm Symkaria. 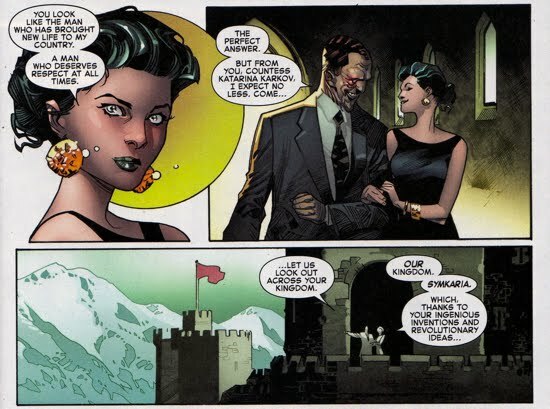 Osborn and Karkov’s romantic dinner is interrupted as the Spidey-led siege on Karkov Castle begins. 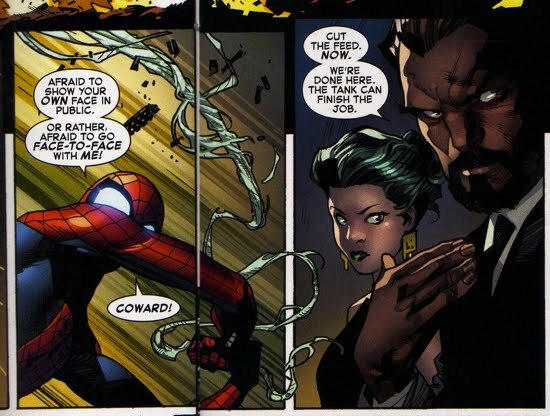 Spider-Man attempts to goad Osborn into fighting, but Norman doesn’t take the bait. Instead he unleashes his army of Goblins (on gliders) and tanks to confront the web-slinger. 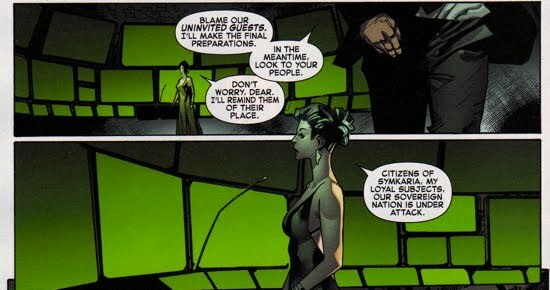 Sable convinces the civilians that they are the good guys and that they (the civilians) need to evacuate Symkaria immediately. 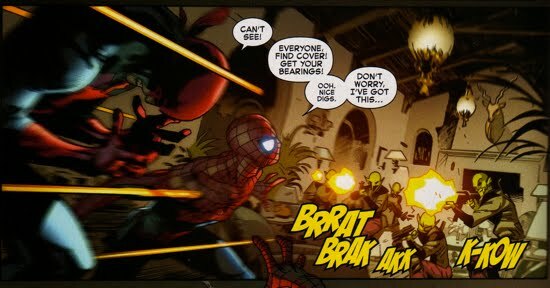 An all-out brawl then breaks out between the Goblin Army and Spidey’s allies. Osborn and Karkov, watching the battle from their war-room tower, decide to unleash their ‘big-ticket item’ since Spider-Man and his forces have made inroads to the castle. Karkov then reaches out to the civilians (over city-wide speakers) and tells them to “seek shelter” and “lock themselves” in their homes. No doubt it was an eerie and ominous message from the Countess. Meanwhile, Spider-Man, knee-deep in a Goblin brawl, notices that the Goblin Soldiers quite resilient as they bounce back up immediately after taking some serious shots. Their strength surprises him and after removing the Goblin mask from one of them he finds that they have Goblin faces as well! The story concludes with Osborn reveling in his greatest achievement, the refinement of the Goblin Formula! Accompanied by the Goblinized-Dragovic, Osborn prepares a missile (presumably loaded with this new Goblin Serum) that he plans to detonate in Symkaria. This would turn every civilian in Symkaria into a member of Osborn’s invincible Goblin Army! As Spider-Man and his allies (Mockingbird, Silver Sable and her new Wild Pack) prepare to storm Castle Karkov, Norman Osborn launches a missile chock full of Goblin Serum at the Symkarian civilians. At the conclusion of the previous issue Osborn had ominously stated that he was going to create an invincible Goblin Army with this bomb. 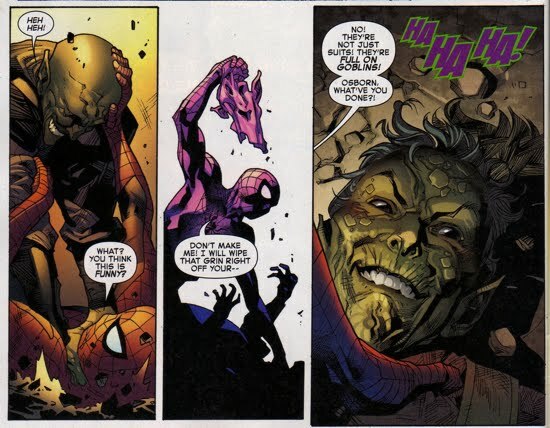 Spider-Man had deduced Osborn’s plan after he had unmasked a Goblin Soldier and realized that they were full-on Goblins underneath their masks. Spidey recognizes there’s no time to waste, he sends Mockingbird to dismantle the bomb mid-flight (she can fly…and she’s really smart!). Sable sends the Wild Pack to fight the Goblin Soldiers whilst she and Spider-Man took the fight the Castle Karkov. Mockingbird makes her way to the missile but soon realizes that she’ll need the help of S.H.I.E.L.D. if she wants to ensure the safety of the civilians. She contacts Fury, who was none-too-pleased to hear from her, but nevertheless decides to aid his former agent since innocent lives are at stake. Once inside the castle, Sable finds Countess Katrina Karkov and the two women decide to settle their beef the only way Symkarians know how…with a sword fight! Spidey leaves to the two to it and he heads off to find Osborn. He uses his Spider-Sense in reverse (ie, heading toward danger) in order to track Osborn within the castle and soon enough the two are face to…melted face. 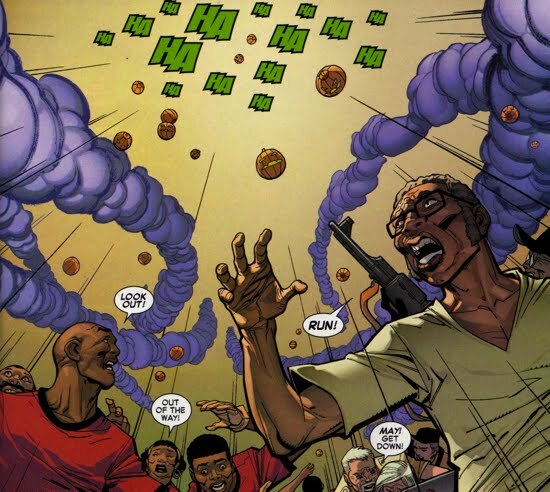 Osborn takes the upper hand at first, letting Spidey know that he’s holding the trigger for the bomb and he will detonate if web-slinger gets any closer to him. This gives Norman the opportunity to run and to have Spidey chase him right into a trap. Even though the web-slinger sees this coming a mile away, he has no choice but to chase Osborn through the castle. En route to Osborn, Spidey is exposed to gas that he immediately recognizes because it’s the classic Goblin weapon that dampens his Spider-Sense. Spidey immediately recalls the death of Gwen Stacy and an enraged web-slinger tackles Osborn through a window in the castle and the two fall multiples stories to the ground outside on the snowy-mountains below. Meanwhile, Mockingbird disables the bomb and tasks the Wild Pack, who were flying the Spider-planes, to “do something Spidery!”. They do, in fact, they catch the bomb with a web net that is a few-miles across. The civilians in Symkaria were saved! Back within the castle, Silver Sable and Countess Karkov continue their battle as Sable takes the upper hand in their duel. Eventually Karkov is forced to surrender. On the mountain slopes outside the castle, the powerless Osborn and the newly-powerless Spider-Man continue to duke it out mano y mano. 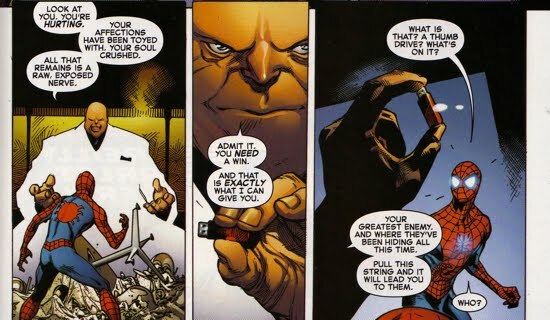 Spidey questions why Osborn didn’t simply kill him after the gases removed his Spider-powers. In typical Norman fashion he retorts, “I wanted to make sure you knew that you were nothing compared to me. Just some dumb kid. That I can break you whenever I want. With my own two hands!” He goes on to say that he never planned to kill him that he wanted Spider-Man and all the people of Symkaria turned into his “loyal Goblin slaves” and that that would be the ultimate revenge on Spider-Man. 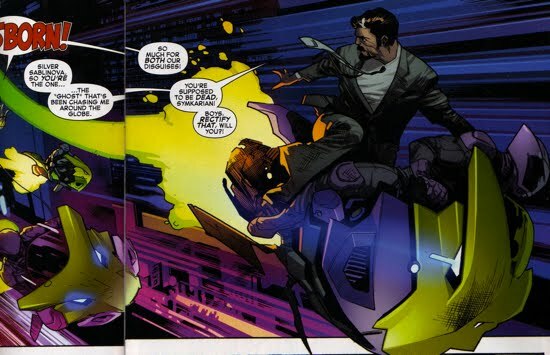 The tables quickly turn for Osborn though, because he soon realizes that his missile had been deactivated. 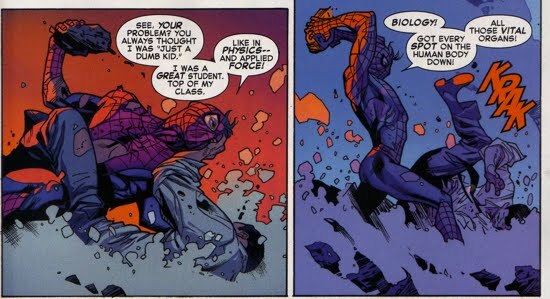 Spidey then catches Osborn off-guard and bashes his head with a rock whilst reminding him that he was not some “dumb kid”, he was a great student. 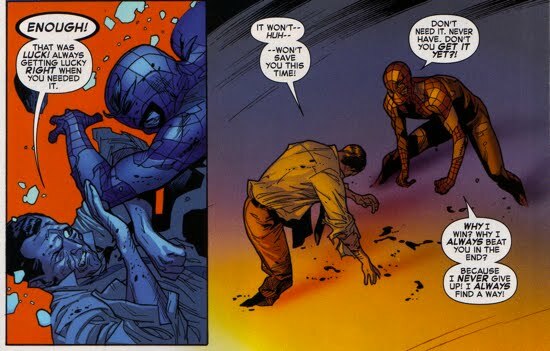 And although Norman contends it was Spidey’s luck that led to his consistent victories over the Goblin, Spider-Man argues that it was due to the fact that he never gives up. Soon after, S.H.I.E.L.D. 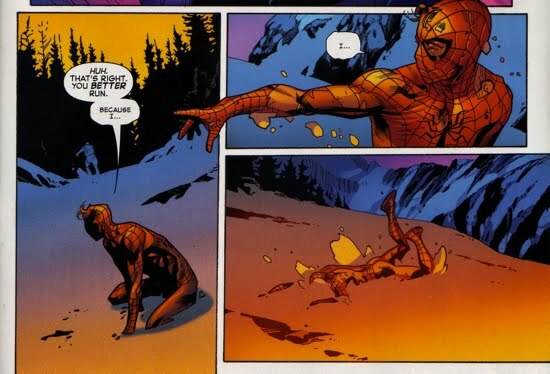 agents arrive and Osborn escapes, Spidey is too weak to chase him and the web-head takes a face-plant right into the snow. 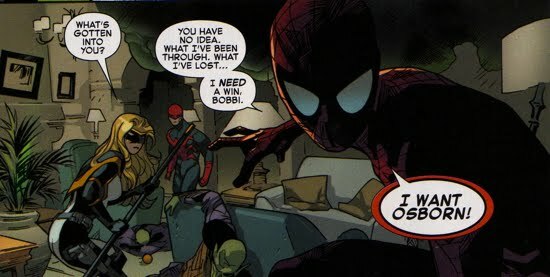 When he wakes up Osborn is long-gone and he’s accompanied by Mockingbird, Sable and Fury. The S.H.I.E.L.D. director informs Peter that they are severing all ties with Parker Industries because of this unauthorized incursion on foreign soil. 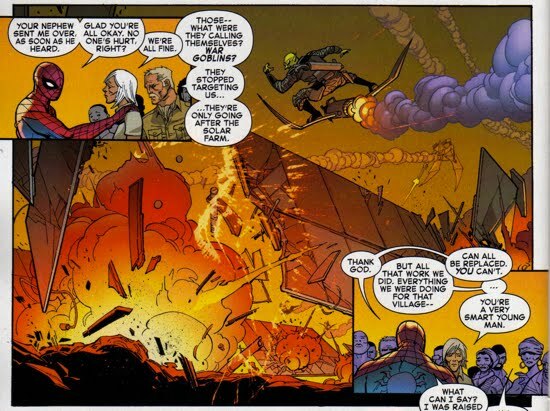 That obviously not good news for Peter but the Uncle Ben Foundation (including Aunt May and Harry Osborn) is in Symkaria handing out food and provisions to the war-tormented civilians. Harry shares a quick moment with Spider-Man and the hero reminds the young Osborn that he is not responsible for Norman and that Harry should go home and be with his two sons. Some of the content featured on this page was also published in my reviews of Amazing Spider-Man (Vol. 4) #25, 26, 27 and 28 featured at SpiderFan.org. Content used with permission from SpiderFan.